The objectives of this study are to assess the trajectory of the heritage conservation system of the Historic Site of Olinda (HSO) and evaluate the impact of this system on the conservation of the heritage assets of the site in the long run. 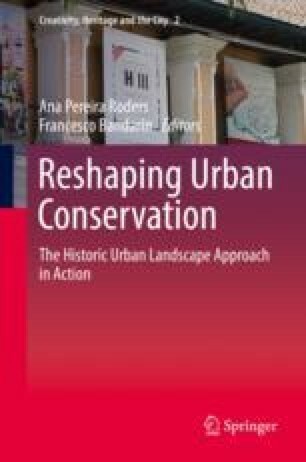 As analytical reference for the analysis will be the Historic Urban Landscape (HUL) approach developed by UNESCO, the period of analysis is 1968–2016. The HSO is a good example of an incremental system that incorporates progressively instruments of urban planning, conservation management, monitoring, documentation, citizen participation, funding, and others that closely followed what would be a similar approach to that proposed by HUL. HSO is also a good example of increasing value of their urban properties due to the conservation policies. The HSO is the main economic asset of the city and, therefore, attracts the initiatives of economic agents to adjust their actions to environmental and constructive conditions of the site, the regulation system, and the opportunities created by the local economic environment. The control and management system of public urban conservation are the adjustment factors between the valuation of the place and the quality of its conservation. In relation to HUL, the case of the HSO is a good example of an incremental conservation system constructed closely to the dynamics of local development process. It shows forward and backward movements as is expected in a complex and democratic society. Also it reflects the larger-scale movement of the interpretation of what is the cultural heritage of an urban historic site. The central questions that the HUL approach tries to help answer constitute the core of today’s challenges for the planning and conservation system of the Historic Site of Olinda. Olinda Prefeitura Municipal. (2016). Plano de Gestão do Sítio Histórico de Olinda: Documento para debate. Olinda. http://www.olinda.pe.gov.br/rlush/plano-de-gestao-do-sitio-historico-de-olinda#.WI-BjRTIxJH.